So, just how do you choose patterns and prints that will work together? It's all about the colours and pattern sizes. 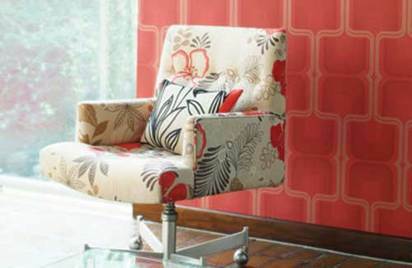 No matter your colour scheme, getting lots of pattern in one room - and getting it right - is never easy. The best approach is to not try to do it all at once. Ideally, you'll get the background print - usually the wallpaper - right, then add pattern within accessories and furniture afterwards. But doing so does make it hard to envisage the finished result. So, how to attempt to do the room all at once, co-ordinating both colour and pattern? Start with the one thing you must have. It might be a wallpaper, a rug, a piece of furniture. Then, build the scheme around it. Let's say in the room above, the wallpaper was the must-have item. Where do you go from there? Ideally, you'd want a plain flooring to set off such a pattern - and the greater the contrast, the more dramatic the result. The silvery sheen in the wallpaper suggests that a monotone approach to both the flooring and the wallpaper would work - and a black/grey/white scheme would also tone down the femininity of the wallpaper's colour. Then, the choice of patterns. Just because you have a nature-inspired wallpaper, it doesn't mean you have to have similarly themed accessories. Here, a wisteria pattern on the chest of drawers mixes happily with a leopard print, an abstract and a graphic print on the upholstery, and with plains on the chest-top and within the mirror frame. Equally, you needn't stick to the same proportions for your print and pattern-repeats. You can mix and match big prints with small ones, but if you do, keep your colour scheme very limited - the more pattern you have, the less colour you'll need or want. So, should you buy co-ordinated ranges? For example, would this scheme work if the cushions were from the same range? Our advice would be to limit your purchase of obviously co-ordinated pieces. Doing so will make your scheme look contrived - and it's much more important for it to look like it's all come together by accident if you want it to look contemporary.